“We will pray for peace every day, but at the same time, the U.S. Army will prepare for war,” said Army Chief of Staff Gen. Mark A. Milley. Adding, “No one wants war,” but the Army must maintain a laser focus on readiness. Milley delivered his remarks at the well-attended Dwight D. Eisenhower Luncheon held at the 2017 Annual Meeting and Exposition of the Association of the U.S. Army. In the speech, an impassioned Milley outlined his views on the Army’s role in a rapidly changing world. As such, “Combat readiness is our No. 1 priority,” Milley said. “The need has become more apparent.” And the need may be accelerating.The most dangerous near-term threat, Milley said, is North Korea. “If history has taught us anything,” Milley said, it’s that we must not ignore threatening words when the threats are combined with capabilities. North Korea issues threats repeatedly, Milley said – and has the ability to implement them. If carried out, those threats could create unimaginable consequences, he said, such as a nuclear strike on the American homeland. Other threats could emerge from Europe or China, he said. Potential adversaries in both locales have been studying our strengths and how to counter them, Milley noted. The Army chief could not say which threat would nor could trigger first, if at all. “I’m not in the business of predictions,” Milley said. “I’m in the business of readiness.” That, Milley said, is the Army’s No. 1 task. As such, he said, the Army is immersed in maintaining readiness. Among other things, the service is pre-positioning stocks and equipment. It also is in the process of standing up a new command aimed at streamlining the modernization process, Milley said, reiterating a plan he announced at the AUSA meeting in conjunction with Acting Secretary of the Army Ryan D. McCarthy. The Army wants new, lethal equipment and weapons. Weapons alone are not the answer, though. “It won’t matter if you’re dead,” he said. As such, force protection is key. So, too, is training. Training must be rigorous, hard and constant, he said, and will include being set in dense urban combat environments. 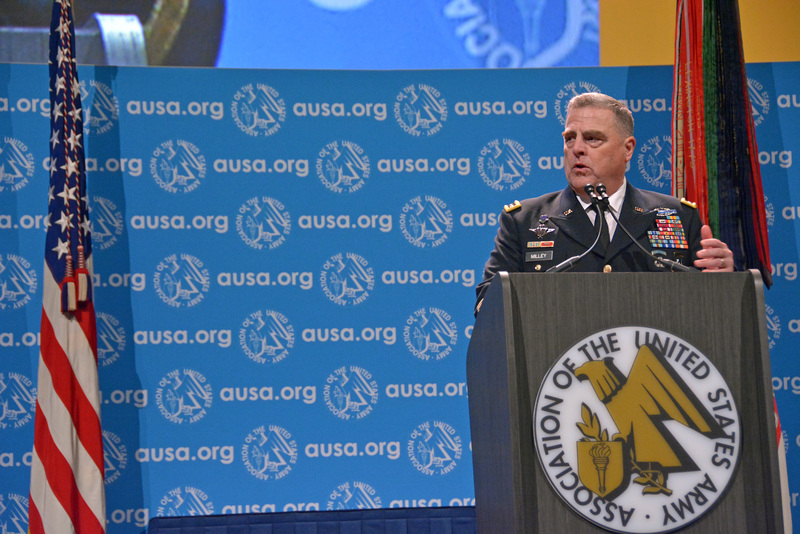 During his stirring address, Milley acknowledged the importance of others. Valued foreign partners provide much value to national and international security, Milley said. So, too, do the American people. “Armies do not go to war,” Milley said, highlighting how the American people consistently pull together in time of crisis, including weather disasters and shocking events such as the recent shootings in Las Vegas. Hence the laser-like focus on keeping the force ready to fight. “It has never been more important,” Milley said. Susan Katz Keating is an award winning writer and investigative journalist specializing in terrorism and national security.